VIsit us at the GFC! The SLPL Grants and Foundation Center has recently presented a series of basic grant programs: Introduction to Grant Research in January, Introduction to Proposal Writing in February, and Introduction to Project Budgets in March. These programs are based on powerpoints developed by GFC partner, Foundation Center* and viewable on the Grantspace* website. Handouts from the programs can be found at the GFC; the programs, along with many of their offerings, are also available as self-paced learning, as well as in Spanish. “So You Think You Want to Start a Nonprofit,” a 2-part program offered by Sue Greenberg of Volunteer Lawyers and Accountants for the Arts and Tracy James from Legal Services of Eastern Missouri. Part 1: "Best Choices and Basic Steps" will be offered Thursday, April 11, 4-5:30 and Part 2: “Nuts and Bolts for Success and Sustainability” follows on Thursday April 18, also from 4-5:30. Sue and Tracy have presented these topics before to great acclaim – so if you are considering starting a nonprofit corporation, have a new(ish) nonprofit, or have been in the nonprofit world for a bit but feel you could up your “success and sustainability” game, you will be sure to learn a lot. In May we will hear from Sarah Buek of The lllumiLab (formerly known as Insight Partners Consulting): "The IllumiLab serves as a catalyst to the change processes that transform nonprofits' insights into impact." Sarah gave a great talk on CQI (Continuous Quality Improvement) last fall, and in addition to great insights and practical tips, Sarah shared book recommendations leading the GFC to purchasesome titles not already in our collection. (A reminder: our collection is always changing and that we always welcome hearing about great new - or not so new - nonprofit titles we should have on hand for our patrons.) On May 23 Sarah returns to Central Library to present “Stop the Measurement Madness: Measurement Strategies that are Meaningful and Manageable,” exploring how nonprofits can find the sweet spot between measuring too little and measuring too much, as well as how to actually do the measuring. The program is from 4-6 (note: a little longer than our usual offerings). Click the links to learn more about the April and May GFC programs and/or to register. ALSO know that the Library now offers free parking in our surface lot a little over a block west of Central Library for program attendees - more information will be made available in the reminder email for those who register. * If you are wondering “what’s up with the asterisks?” in the first paragraph, you likely weren’t at either the February or March presentation where we shared the exciting announcement that Foundation Center recently merged with another nonprofit thought leader, GuideStar, and that the new entity will be known as Candid. The rebranding will be rolled out over time, but should not impact the resources that the GFC offers via Foundation Center/Candid. 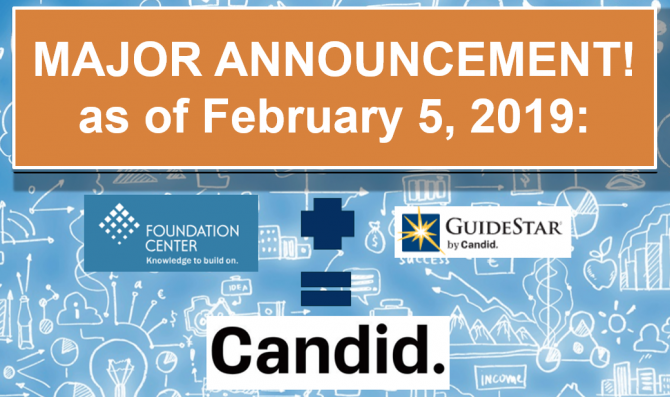 Watch this space – or visit the GFC – to learn more about the GuideStar half of Candid and how nonprofits can use their free tools both to learn about other nonprofits and to improve their own nonprofit profile. In February 2019 our partner Foundation Center merged with GuideStar to create a new entity, Candid.